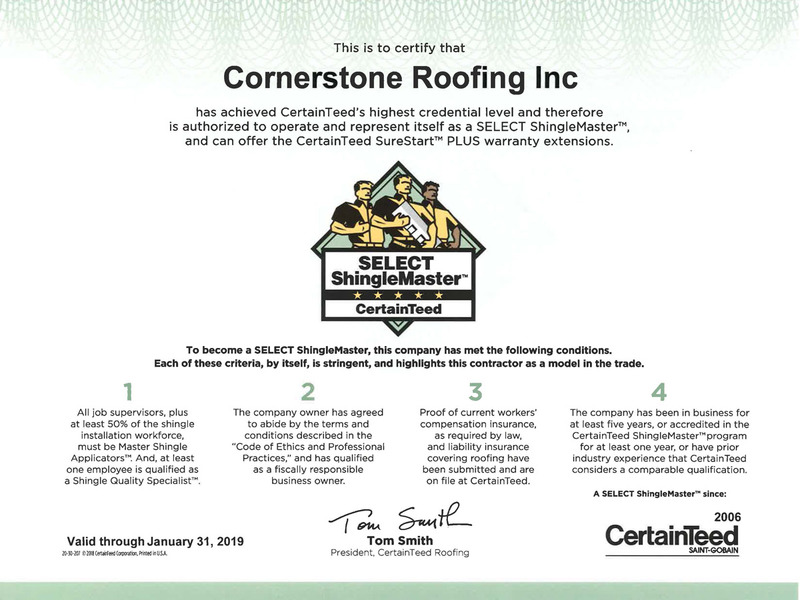 2018 CertainTeed SELECT ShingleMaster Certificate - Cornerstone Roofing, Inc.
And we have been in business for over 22 years and a SELECT ShingleMaster for over 12 years (5 years is the requirement). We look forward to continuing our SELECT ShingleMaster status with CertainTeed in the years to come. Cornerstone employees are Shingle Quality Specialist certified as a part of the CertainTeed SELECT ShingleMaster credential level. Earning the Shingle Quality Specialist designation means the employees have passed the CertainTeed Shingle Technology test which covers roofing shingle products and quality standards. Through testing and regular re-accreditation, Cornerstone’s roofing installation crews, Foremen, Job Supervisors, and Estimators are Master Shingle Applicator (MSA) certified through CertainTeed. Completing the MSA Test also makes the roofing installers qualified to install a CertainTeed 5-Star SureStart PLUS warranted roof.